Many common, high-volume medical devices (think syringes and bone screws) are small. Packaging systems that fit in the palm of your hand will suit them well. Accordingly, a standard environmental conditioning chamber can test hundreds of those little life-savers, no problem! How easy life would be if every case were that simple. In reality, lots of medical devices are bigger than you’d expect. Surgical kits, for example, might bundle a series of components together in a single package, becoming oversized and/or bulky. Multiply that packaging system by volume pallet configurations and suddenly, it can be tough to find testing accommodations. Our engineers know all too well the importance of testing packaging systems at all levels. You need to know how each element responds through climatic conditions in the distribution channels. Sometimes it gets complicated, yet, nothing can be left to chance. What’s a team to do? 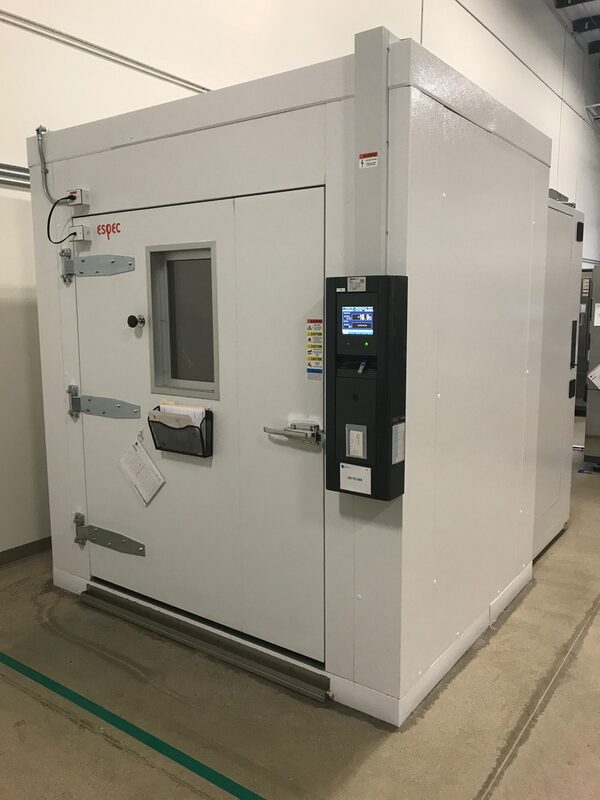 Our answer is simple: Meet PCL’s newest walk-in ESPEC conditioning chamber, where big is beautiful. This 279-cubic-foot powerhouse is designed for testing functionality, operation, durability and more. To give you an idea, this is nearly nine times bigger than a standard reach-in chamber, with 32 cubic foot capacity. Even more, the new chamber’s performance is just as maximized as its size. Temperatures can be set as low as -35°C (-31°F) and as high as 85°C (185°F) . (Tip: Don’t get locked in.) Relative humidity settings, from 10% to 90%, can be set. Finally, we can specify temperature ranges in conjunction with humidity settings to simulate various climate conditions. Most importantly, we can now fully test palletized loads to ISTA standards, ASTM D4332 or custom cycles using your specifications. The conditioning chamber can test two full pallets at a time, allowing plenty of room to plan large shipping configurations. We’re excited to bring this capability to firms whose medical device or shipping configurations surpass the everyday syringe. Please reach out if you have questions about the new chamber or your medical device packaging scenario. It’s why we’re here. For immediate help, call or use our live chat (lower right of your screen). We can test your palletized loads to ISTA standards, ASTM D4332 or custom cycles using your specifications. Have You Heard What They Said?